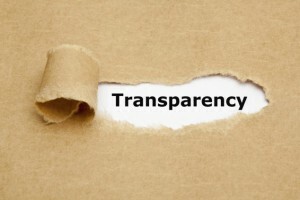 TRANSPARENCY is an important topic in today’s culture. Nothing is to hidden. Nothing is to be concealed. Nothing is to be covered- up. Everything is to be exposed. Everything is to be out in the open. Everything is to be made known. Writing to the Corinthians, Paul talks about the foundation he laid for the church in Corinth and how others will build on that foundation. And whether their work is gold and silver OR hay and straw will be revealed. Because “each one’s work will be revealed, for the day will reveal it…” (1 Cor. 3:10-13). THE DAY that Paul is pointing is the LAST DAY when Jesus comes again – and it will be ‘FULL TRANSPARENCY DAY.’ Everything that was HIDDEN will be brought out into the OPEN. Everything that was COVERED will be REVEALED. Adam and Eve tried to hide themselves from each other and from God. There were things they didn’t want the other to see in them, their shame and guilt. And both wanted to hide the same from their Creator. They hid themselves behind some leaves and trees. Just to be clear, IT’S NOT THAT, on that Day, our Lord will finally see everything and all that had been hidden from Him will now be revealed. IT’S NEVER BEEN HIDDEN FROM HIS SIGHT. HE’S ALWAYS SEES IT ALL. And ‘THE DAY’ is coming. As to when, “no one knows, not even the angels in heaven, nor the Son, but only the Father.” It has not yet been revealed. It could be next year, or next week or tomorrow or before we get to the closing hymn, but one’s things for sure, “you do not know when the master of the house will come.” This is no time for delay or procrastination, or for unbelief. REPENT AND BELIEVE. REPENTANCE turns everything we have been saying so far upside down. Rather than trying to hide our sins of thought, word and deed from God, we REVEAL them by CONFESSING them to Him, firmly believing and not doubting that He then HIDES them from HIS OWN SIGHT in the body and blood of His Son, Jesus Christ our Lord. Now, can we begin to understand why the Holy Spirit tells us that for the believer, “that day” will be a wonderful surprise and a jubilant celebration that never ends? For what will also be REVEALED on THAT DAY is all of those works were done by faith in His Word of Promise which this world never saw. How many ‘unsung saints’ who went about the daily work given them by the Master to do: mother or father, husband or wife, sister or brother, friend or neighbor, co-worker or class-mate, did the work given them by their Lord, FAITHFULLY and without recognition, some even scorned, some abused. But what rejoicing there will be when “each one’s work will be revealed, for the day will reveal it. “But you, beloved, building yourselves up in your most holy faith and praying in the Holy Spirit, keep yourselves in the love of God, waiting for the mercy of our Lord Jesus Christ that leads to eternal life.